Published: Sep 19, 2015 to ? It's a year before Yumeko transferred to Hyakkaou Academy. Saotome Meari, a young girl who was born into a very ordinary family, passed her transfer examinations, and has started to attend Hyakkaou. However, the school she expected to attend has a crazy law, the Baptism of Gambling. Paired with Yumeko as her "twin," the curtain opens on Meari's gambling mania! 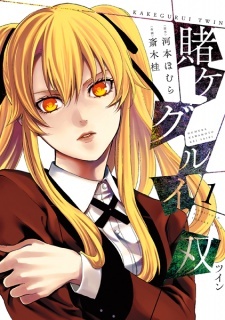 Kakegurui Twin has been licensed in Spanish by ECC Cómics.